Georgia’s new Ambassador to the United States, Temuri Yakobashvili, is a long-time senior government official and a respected scholar who is a well-known figure in Washington and the capitals of Europe. Before assuming his posting in the United States in early February, Mr. Yakobashvili was Deputy Prime Minister and State Minister for Reintegration for the Government of Georgia. In that capacity, he was the architect of Georgia’s “engagement strategy” for improving relations between Georgia and the regions of Abkhazia and South Ossetia, which are under Russian occupation. 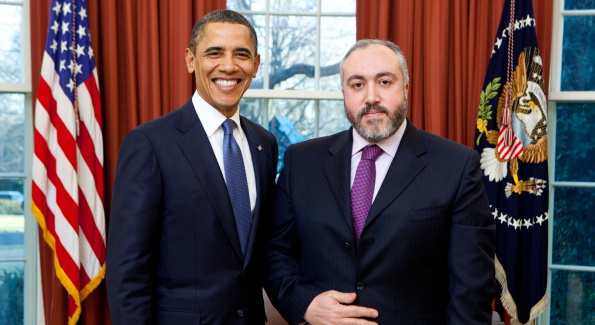 Yakobashvili presented his credentials to President Barack Obama on Wednesday, February 23. His selection underscores the importance Georgia places on their partnership with the United States and the evolving relationship between Presidents Obama and Saakashvili, who have held two meetings in the past few months. In a broader sense, the choice of Ambassador Yakobashvili should give Americans in general and Washingtonians in particular a much fuller appreciation for all things Georgian. Ambassador Yakobashvili is a gregarious, fun-loving connoisseur of Georgian wine, food and culture who plans to adorn his home with Georgian art and will have a traditional Georgian cook on staff. He is very interested in ensuring that Americans develop a more three-dimensional understanding of Georgia. Georgia’s new Ambassador to the United States, Temuri Yakobashvili. Mr. Yakobashvili joined the Ministry of Foreign Affairs in 1991 and held a variety of senior positions, including that of Director of the Department for the USA, Canada and Latin America. He holds the diplomatic rank of Ambassador Extraordinary and Plenipotentiary, granted by Georgian President Mikheil Saakashvili. 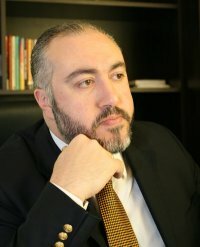 Mr. Yakobashvili is co-founder and Executive Vice-President of the Georgian Foundation for Strategic and International Studies (GFSIS), a leading think tank in the Caucasus region. He also co-founded the Atlantic Council of Georgia and the Council of Foreign Relations of Georgia, and he is a member of the Governing Board of the Georgian Institute of Public Affairs (GIPA). He regularly contributes to local and international media on issues of domestic and regional security and transformation. In 1990, Mr. Yakobashvili graduated with a degree in Physics from Tbilisi State University. Following several years of employment with the Ministry of Foreign Affairs, Mr. Yakobashvili completed Mid-career Diplomatic Courses at the Center of Political and Diplomatic Studies at Oxford University in 1998. Additionally, he participated in both the Yale World Fellow’s Program (2002) and the Executive Security Program at Harvard University’s Kennedy School of Government (2004). In 2006, Mr. Yakobashvili was a visiting researcher at the Silk Road Study Center of Uppsala University in Sweden. Mr. Yakobashvili and his wife, Ms. Yana Fremer, a respected senior television journalist, have two children.